Amorita is made of pine wood from Oregon, oak and teak. It belongs to the One Design ClassCalifornia 32 and it’s Cholita’s twin. The name of that class comes from its hull flotation, 32 feet (9,75 meters). As well as other ships of this class, Amorita was built with reverse mold (the first time this technique was used in California). Those hulls obtained some really respectable positions on the oceanic regattas of the Pacific. In 1959 and 1960 the Gipsy won Californian Lipton cup. The Latium former leader, Claudio Mealli acquired it in 2005 in San Francisco. 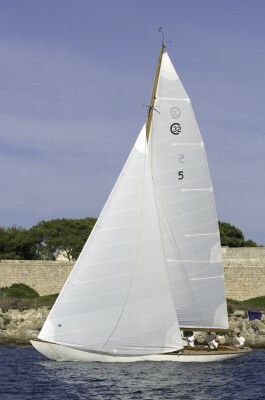 The Amorita was restored at the Porto Santo Stefano Argentario shipyards (Toscana) keeping original the picea’s mast (European spruce wood) from 1937. The Amorita came back to the sea in 2007 awarded with the Panerai Classic Yachts Challenge the same year at the Vintage Boats category.